What happens if we have tried to find women but there is nobody available? Try harder. I’ll be happy to suggest some women who would be much better than me. You may need to organise your conference a little earlier to be sure of getting women on your panels. What happens if a woman drops out and we end up with a men-only panel? There are many brilliant women – please find someone else to take her place. What if a woman drops out at very short notice? Organising conferences is hard enough already? The Gendered Conference Campaign has some great advice for conference organisers. Keep drawing attention to the issue. If you are at a conference with male-only panels, call it out. 2,034 Mr David Mitchell Tostadores de Ometepe S.A.
1,854 Mr Chris Ferrary Temple Group. Ltd.
1,811 Mr Gil Friend Natural Logic, Inc.
1,785 Dr. Paul Atherton Fab Inc.
1,698 Mr Kelly Starrett MobilityWOD, Inc.
1,402 Mr Mike Gifford OpenConcept Consulting Inc.
1,395 Mr Larry Cooper AdaptiveOrg Inc.
1,387 Mr James Siegal KaBOOM! 1,087 David Wofford Meridian Group International, Inc.
767 Paul Herman HIP Investor Inc.
689 Mike Bracken The Co-op. 602 Brett Matthews My Oral Village, Inc.
559 LORNA SPEID SPEID & ASSOCIATES, INC.
477 Joyce Morin American Baptist Churches, U.S.A.
409 Will Bugler Acclimatise Group Ltd.
107 Javier Padilla Andalusian Health Service, Seville. 29 Craig Keen Professor of Systematic Theology at Azusa Pacific University. 17 Raúl Calvo Physician.Castilla La Mancha Health Service. 3 Sean MacGregor Student at Liverpool John Moores and member of Liverpool Young Labour. Last year, six leading Washington think tanks presented more than 150 events on the Middle East that included not a single woman speaker. Fewer than one-quarter of all the speakers at the 232 events at those think tanks recorded in our newly compiled data-set were women. Because I believe you cannot conduct constructive discourse on international issues without the participation of women, I recently decided not to speak on any panels that did not include women. I’m not writing this to seek a pat on the back. But because any discussion that does not include women’s perspectives or that reflexively excludes or fails to seek out the women who are leaders in their fields in virtually any and every subject on this agenda will be deeply inadequate and will only compound distortions of gender bias that exist because of our long history of systematic exclusion of women’s views. I’d much rather participate in discussions where the organizers actually demonstrate that they are committed to producing the best possible work product. I often attend panels or discussions dominated by men, especially in technology. This is problematic since it sends the signal that only men have the expertise in their given field. To their credit, some men are initiating change. There is no topic that cannot be discussed by women. There is no circumstance that would prevent one from inviting women. There is simply no rational excuse for excluding women. 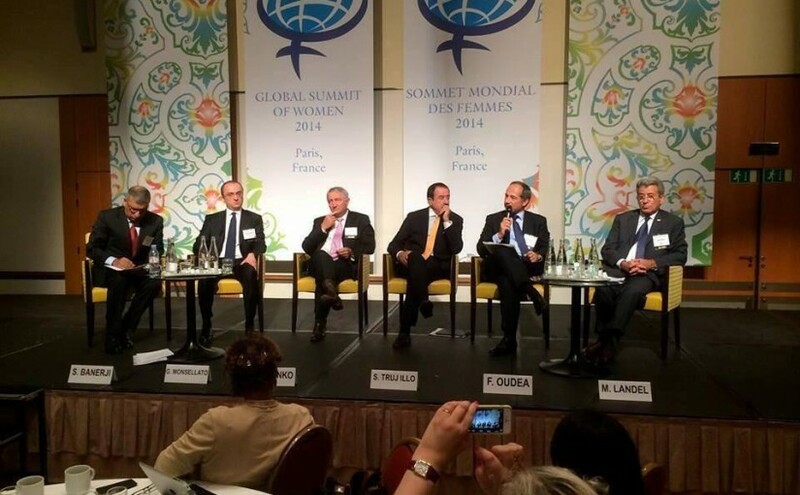 And, if you are invited to join a panel with no women, you must conclude it is being organized by fools. This is all over the music field. I stand with my bosses, colleagues, and pals. So many rumblings surrounding this issue, must become loud and must have awareness-raising at the heart of their goals. Attempts at gender conscious programming are weak at best, as are efforts which consider other diversity issues on panels, etc. This is a solid pledge. Thank you. This is a fantastic pledge, and I hope it generates real change in the way conference organizers (and all kinds of organizers!) think and plan their events. Credit to those who already do — thank you! I honestly can’t see why this would be a problem, women are everywhere… doing everything. I do so pledge. I have just finished 8 days National review meeting and Guidelines/ strategy validation workshop in Juba. More than 40% of the participants and presenters were women! A small action that hopefully gives others pause for thought. Cheers Owen for championing this. And it is correc that gender is the balanced and equitable sharing of responsibilities between me n and women and one still don’t see how his could happe n still today without some sort of affirmative action and positive discrimination today in favor of women in many sectors where they are yet left behind . Thank you for the initiative. I’m happy to make this pledge. Happy to sign up. It’s not just about gender – a broader diversity of viewpoints is important. Great initiative – and about time. Happy to sign up. Agree with this point as well, of course — happy to support diverse viewpoints. Cass Sunstein and Reid Hastie (in ‘Wiser’) make clear dangers of not doing so. At last this issue hits the agenda! In addition I would add that Women are equally equipped to make appropriate decisions. I’m in – great initiative! Delighted to sign up! Thanks for the initiative. Using our power to address the biases that have given us that power in the first place. I like it. Would you pledge to require that there be at least one female candidate for the next top job you get recruited for? Boris – thanks. I’m in favour of requiring women on shortlists. Great idea, Great initiative….wish for great success on ground! Thanks for your efforts, Owen! Just to clarify — it would also be nice not to see ‘gender’ panels that are only women! Definitely true. This should work both ways. Owen, I have signed the pledge- great idea should be a principle rather than a requirement. I really support this initiativa. I think it’s a great idea to encourage diversity in all public discourse, but I’m surprised and disappointed in the exclusionary language of this pledge. The posts on this site go out of their way to say that there is no subject about which women cannot speak…that is certainly very true…and that there should never be a public panel discussion without a healthy ratio of females…but when it actually declares the pledge, it says nothing about all woman panels. In the interest of true equality, shouldn’t it encourage that people abstain from any panel that excludes either gender? It is true that there is no subject that could not benefit from a woman’s perspective, but is the opposite not also true? @@ Because there are so very many all-women panels that are not about how to succeed in business despite discrimination against women. If you actually bother to look, and I don’t think you have, you’ll find that academic panels discussing women’s-studies/gender issues generally do have men on them. Because the women are already conscious of this issue and take it seriously. Well… that’s a good start, but you’ve set us up now for tokenism. I’d suggest bumping it to two women, Bechdel-like. You know, where the question’s whether a movie’s got two women, with names, who at any point in the movie have a conversation without a man around, about something other than a man. Good stuff. Practical. And certain to lead to better conferences. Count me in! Is the only way to force the issue. Dave Ramsden was talking up your initiative at a recent RES/GES/Bank conference in response to a question about getting more women into economics – you should get him to sign up! great pledge owen – count me in. Jon Shepherd – no affiliation. Any chance of changing the wording in that way? It would keep the same meaning for the pledge without excluding a large swathe of people who are even more disproportionately under-represented than women at these kinds of events. How is this pledge being enforced? I’m at a conference not only attended, but ORGANIZED by one of the individuals on this pledge list. Opening panel – all white European men. Excellent — though it has been quite a while since I’ve been on an all-male panel…. I think this is a very good initiative and will happily sign myself up to it! Great initiative! Please add me to the list. Of course! As it should be. It seems frightening to me, abandoning the meritocratic approach to debates. Shouldn’t we find the best people for the job, regardless of gender? Rather than arbitrarily deciding, that having both sexes on every panel automatically makes it better? Morty – I don’t regard this as abandoning the meritocratic approach to debates. I regard it as considering the qualities needed for the panel as a whole, rather than considering each panel member separately. Just as management teams are better when they are diverse, debates and ideas are better when they are exposed to diverse viewpoints. We will have more and better ideas when we open our debates to more diversity. Please add me to the list. Gender equality is WAY overdue!! Inclusion and gender balance, are the beginning, not the end of addressing gender inequality. I believe that public discourse would be improved by better representation of all genders. At a public conference I won’t serve on a panel of two people or more unless there is at least one non-male panel member, not including the Chair. This is a superb idea, and I would like to sign the pledge. Please do add my name. Great initiative and very happy to take this pledge. It’s a shame this pledge needs to be made in the first place, but I’m definitely in. I’m pleased to make this pledge. Thanks Owen. thanks Owen – i’m definitely in, but would also like to encourage broader diversity in all panels, discussions, workshops – everything. pale male panels need to make way for the inclusion of all voices, but particularly those who can best represent the topic at hand; and in our work, that means more voices from the global south, male and female. Thanks. I agree with all of this apart from one small word: “but”. You mean “and”, right? I can’t see any implied contradiction between what you say here and the pledge above. This is great. Perhaps we should also pledge not to attend any sessions that just have men on the panel! To all women who signed this pledge: congratulations! You are almost certain to keep your promise. Men: stay true! I think we should add that the moderator, when opening the floor for questions, gives the opportunity to woman, man, woman, man, as too often men are asking the floor first. And also too often they don’t have a question, but they just give their own speech..
Pingback: Pass the mic – Costa Rica to Antarctica! Pingback: Pasá el micrófono – Costa Rica to Antarctica!